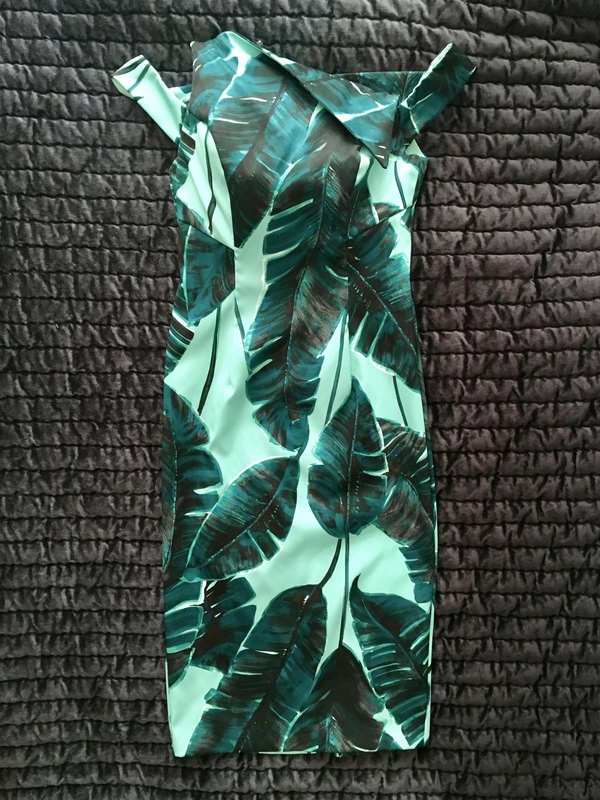 You know you’re kind of obsessed with botanicals when your latest acquisition happens to be a dress that’s covered in banana leaves. The I.E. hubs may think I’ve gone a bit bonkers, but then he doesn’t really pay that much attention to interiors and fashion world so I’m ignoring the “It’s err very green darling” comment. In the meantime, until I find somewhere to wear it, I’m going to imagine myself sipping cocktails with Club Tropicana playing in the background….. Right back to reality and today’s post. There’s a valid reason for mentioning said lovely dress. Botanicals may be a bit hit with some, but for others, they can be intimidating especially on the walls. It can also be difficult to know what to put with them to create a cohesive design scheme. I’ve picked a few of the latest wallpapers out there and put a little look together for each other them just in case you might need some inspiration. Ready?….. 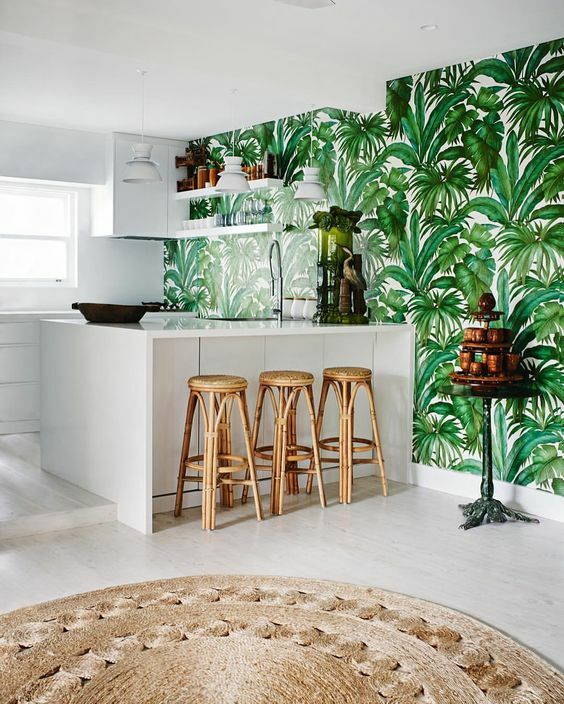 The Greenery trend has hit us big this year and it appears to be growing and so have the wallpapers featuring every wonderful aspect of nature. I say who needs art when wallpaper can look this great! I’m easing you in gently in case the bold and colourful scare you with a subtle number from the awesome wallpaper designer Woodchip & Magnolia. Their Maiden Botanical Silhouette wallpaper is, in fact, a photographic design of grasses that create a tranquil and restful vibe. 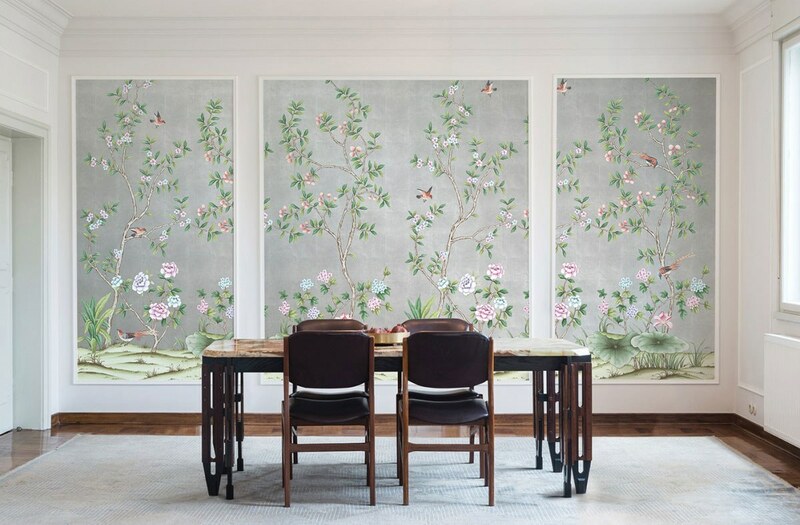 I love the delicacy of this one and it’s a great way to introduce wallpaper and botanicals to your homes if you’ve been shying away from them up until now. 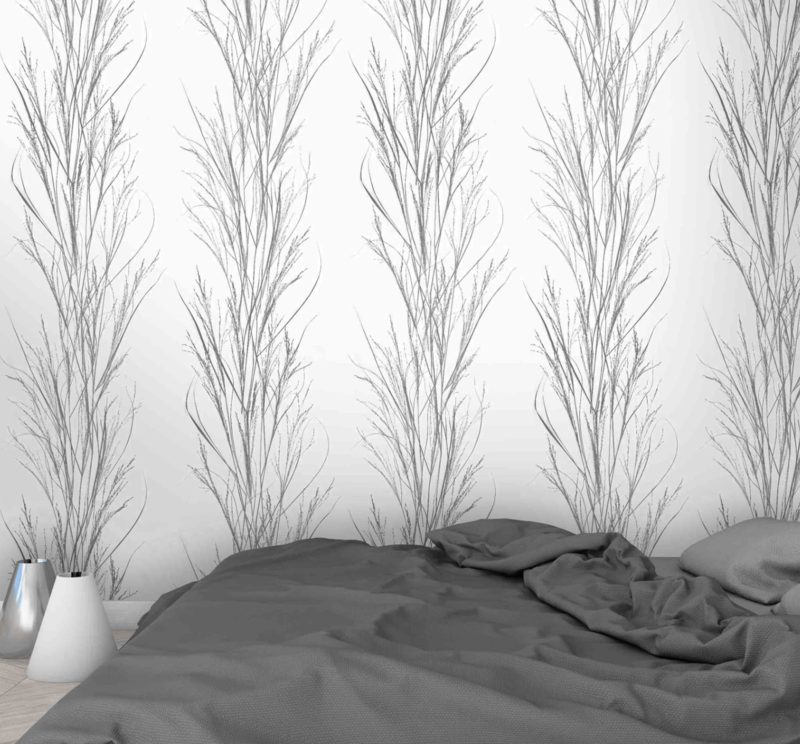 This Maiden Grass wallpaper is fab for creating a look that’s not too feminine, and a little bit edgy. I’ve added some concrete texture by way of a bedside table, whitewashed flooring and some hints of soft chalky yellows through accessories. Oh and don’t forget to add some black details as this will help ground the overall look of the design and stop it from looking too wishy-washy. 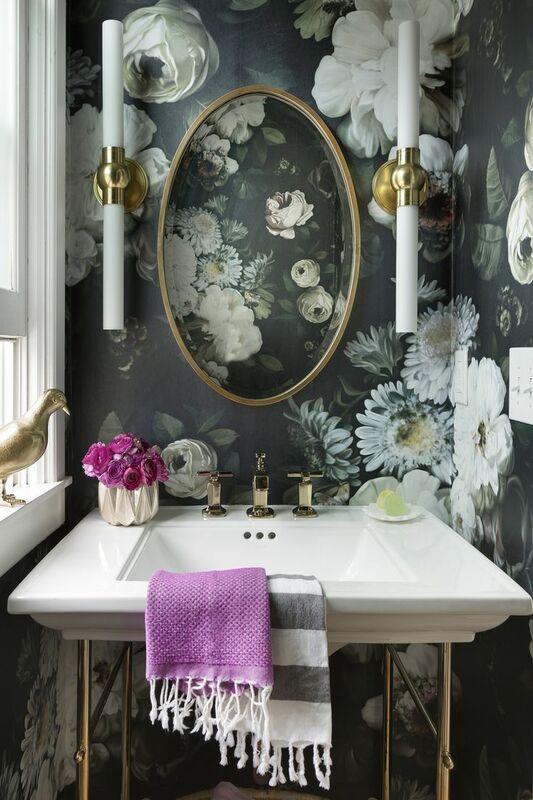 If you want a more feminine look, this wallpaper is really versatile, opt for some dusky pinks and soft linens and add metallic textures to add a little bit of glam. This Banana Leaves design is by the wonderful wallpaper designers Mind The Gap. It’s bang on trend adding some Greenery vibes to your homes with a tropical feel, a bit like my dress. Mind The Gap actually have a whole array of tropical botanical wallpapers to choose from, so it was tricky deciding which one for today’s post. I’ve picked this particular wallpaper to show you that bold and larger scaled botanicals don’t have to be scary as it has a warm neutral background to it. If you think about it green, as in nature, compliments any colour. It’s actually easier to implement if your homes more thank you think it woul be. Textures, particularly natural ones are key to styling a space with large-scale foliage wallpaper. I’ve gone for a bit of a boho feel by adding lots of natural elements such as the coir carpet and decorative wall baskets. I could have kept the overall design neutral in colour, but decided to add some russet reds to add warmth. Don’t be scared to add additional pattern to your spaces with larger scaled wallpaper like I’ve done here with the Bedouin rug just make sure they compliment the overall look and feel. Again small elements of black from the dipped bamboo pendant to the legs of the chair and table all help ground the design scheme and pull it together by adding some depth. Alternatively, you could keep the overall look more neutral like this one from my post on How to Make Your Kitchens Stylish & Unique To You . This wallpaper has a whiter background to it which they have used in other design elements letting the wallpaper be the star and focus of the kitchen. A clean and fresh look ideal for a kitchen has been created. 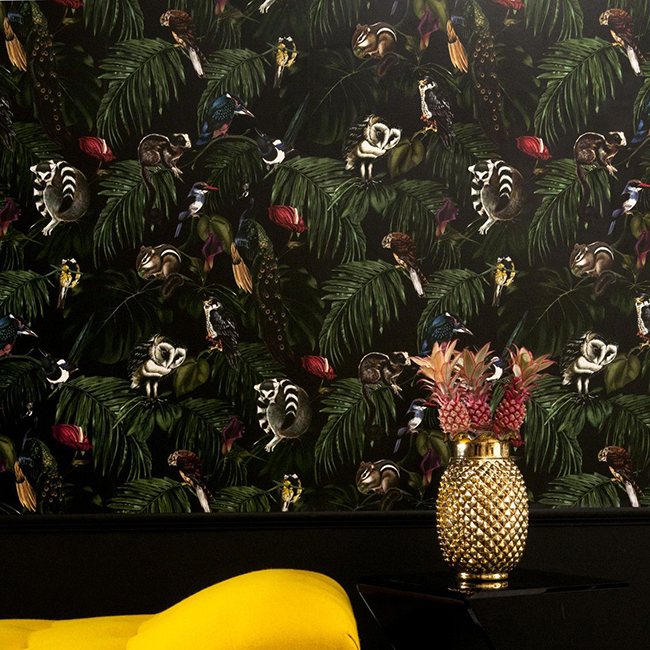 Right now onto a real show stopper of a wallpaper, Dark Amazonia by Witch & Watchman. Yes, it’s bold and dramatic, but I just can’t help love its exotic jungle vibes. Perfect for those who are loving the darker style spaces and who embrace maximalist designs. It would make the ideal backdrop for those looking to make an impact full of character and style to a room. Dark Amazonia is just one of Helen Wilsons amazing designs. As a fine art graduate, she has created detailed hand painted oils on canvas which are then digitally printed on to top quality paper to adorn your walls with. They are quite simply works of art and I could spend hours looking at them. You could go full length and really make an impact with this wallpaper, but here I’ve broken it up by using wood panelling to the lower half of the walls. It’s not only easier on the eye, but I like to think the wood panelling adds to the character of the room and almost framing the wallpaper as a work of art. The Brighton Sofa with its beautiful Amazilia velvet fabric ties in beautifully with the Amazonia wallpaper as it picks out the colours within it. They are like a marriage taking a little piece from each in terms of colour and the exotic. If you read my post on Your Guide To Using Pattern In Your Homes, you’ll know to pick out the secondary colours within a wallpaper design to create your overall design scheme with. As with any darker styled spaces, reflective textures are essential to ensure as much light is bounced around. Look to metallics and mirrors. Finally, if you’re still unsure…..
Don’t be put off by larger scaled botanical wallpapers. They can be less overwhelming than smaller busier patterns. Colour, texture and the design of your wallpaper should be taken into account when designing your room. Brighter more colourful papers will dominate a room more than one that is more neutral in colour. Going for larger bolder designs you will need to ensure that you have a stretch wall in your room in which to show it off on. I love this idea of using panels instead of a whole wall. It not only breaks down the botanical design into pieces of art for your walls but also helps as they create manageable blocks for our minds to process so they’re less overpowering. Cloakrooms and hallways are the perfect spaces to introduce bolder botanical wallpapers as we tend to spend less time in these spaces. It’s also a chance to experiment with different textures to compliment your chosen wallpaper too. Sometimes, it’s all about having the confidence to embrace what you love and if that happens to be botanicals, then all that’s stopping you is YOU. Afterall your home should represent who you are, what you love and what makes you happy. There are so many other wonderful wallpapers, botanical and otherwise that I could quite easily spend hours writing about them. If only we all had more time to indulge ourselves! So for now, I’ll be off juggling the youngest with the summer holidays whilst dreaming of cocktails and playing Club Tropicana. Until next time…..